Leopard seals are part of the family of animals call the ‘Pinnipeds’. This latin name translates to ‘wing-footed’, referring to the ‘wing-like’ shape of the fore flippers of many the seals, sealions and walrus species. Leopard seals are also known by the Latin name Hydrurga leptonyx, where hydrurga means “water worker” and leptonyx is Greek for “small clawed. They are known to live to at least 25 years of age. 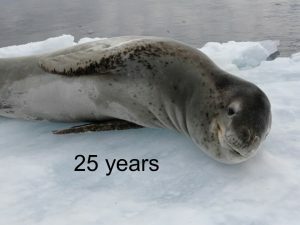 Leopard seals are known to live at least 25 years. Although often referred to as ‘vagrant’ in New Zealand waters, the data that LeopardSeals.org has collected shows a very different picture. We are preparing a fact-sheet which we will host here soon.